I thought you may like to see this process. 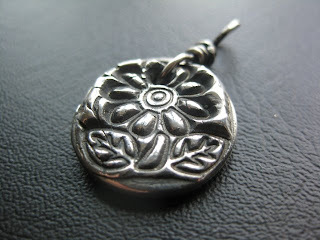 Today I'm creating silver charms using precious metal clay (PMC). PMC is a combination of pure silver and an organic binder. 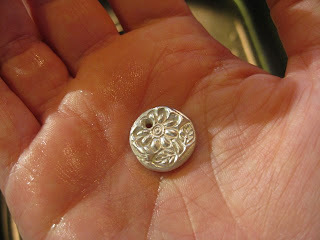 The charm is first created using the white metal clay, then left to dry completely. 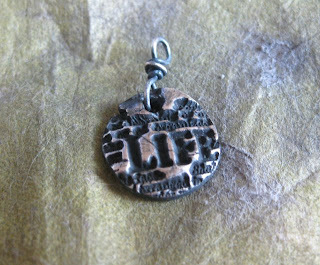 Sometimes I carve images or words into the clay. This time I used stamps. 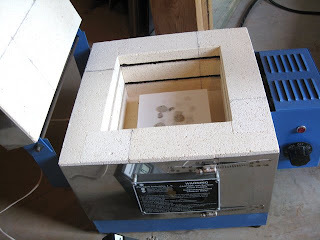 Next, I load the charms into my handy dandy kiln. 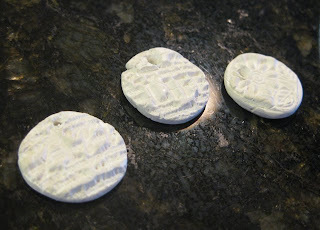 The charms are white because of the residue that's been left behind. Nothing my brass brush can't take care of. I use a brass brush and a little soap and water to brush away the residue. 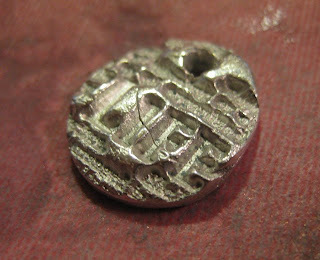 a rough piece of silver, but not for long! 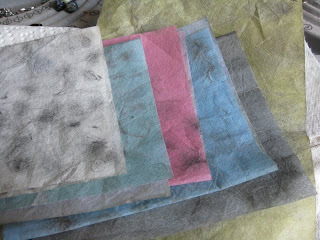 I'll start with my polishing papers which, I know, look pretty sad. Note to self: buy new polishing paper. Like sandpaper, the papers go from coarse to extra fine, six in all. Still looking pretty rough, isn't it? Hold on, not finished yet. 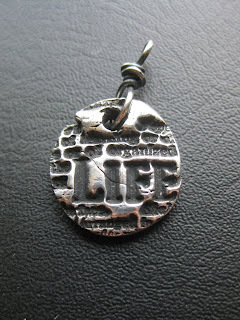 liver of sulfur, which instantly ages the silver. EW! I break my polishing papers back out and it finally begins to look like something. Finished! I'll call this one "Life is Rough"
Now, I'll quit goofing off and get back to the studio. 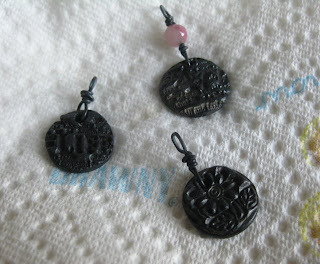 Finished jewelry coming up shortly! Lori, this is so cool. I love learning how folks do things...I had no idea there were so many steps! 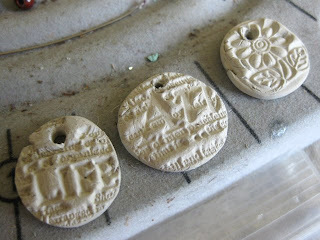 Oh my goodness, Lori thank you for sharing such an interesting "behind the jewelry making scene!" I have been curious as to how it's made. Very neat. I am sure you will come up with some fabulous pieces to add to your already fabulous line! That is so awesome and they are so wonderful. Thanks for showing us that! Really cool! Thanks for sharing this. That is soooooo cooooool!! Thanks for explaining and showing us the process. I love to learn how people do their craft. Hi Lori, thank you so much for showing us the process to work with PMC. 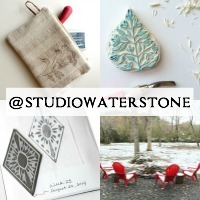 May i ask you a question about your kiln ? Is it really necessary ? Or only for your type of pieces ? I saw someone using a torch to fire a little piece. And, by the way... what king of kiln (not too expensive of course...). So interesting! Seriously, you DO learn something new everyday ☺! I'm loving the fact that you are letting us into your world to see your process. This is so cool to see! so cool and interesting! great tutorial... I can smell that yucky stuff from here! I love your finished charms. Please accept my invitation to drop in at my place one day this week when you get a moment. I have become a follower and would be honored if you choose to do the same!